The mission of the Fuquay-Varina Garden Club is to encourage interest in the art of gardening, garden design, flower arranging and horticulture while improving the environment through beautification, protection and conservation. 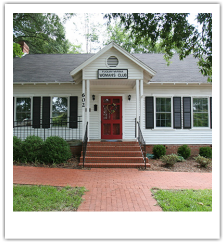 Thanks to the efforts of Fuquay native and community champion, Shirley Simmons, the Fuquay-Varina Garden Club was re-established in the year 2007. Shirley placed a classified ad in the local newspaper asking those interested in forming a garden club to give her a call. Over 30 area residents responded and the new Garden Club’s first meeting was held in April, nearly fourteen years after the original Fuquay Garden Club disbanded. The members of The F-V Garden Club invite you to be apart of this organization where we learn from each other, guest speakers, attend field trips and conferences, and support our community. Experience is not necessary and your first two meetings are free! We meet the 3rd Thursday each month at the F-V Woman's Club Clubhouse, 602 N. Ennis St. Join us at 7:00 PM for refreshments & a featured guest speaker. Email GardenClubContact@gmail.com for more information.Note: Meetings are held from August - May. * National Garden Clubs, Inc. Downtown Sculpture Project - This is an ongoing effort that was started about four years ago. We continue to work towards the goal of acquiring an appropriate sculpture for our downtown. 2012 F-V Garden Club NC State Fair - "Imagine That" Blue Ribbon Winner! Each year the club holds at least one fundraiser which supports our many contributions to our community and students. Fall of 2018- September 29th we will hold a BBQ and Silent Auction at The Garden Hut from 11 AM - 2 PM. Spring of 2019- Every other year the Fuquay-Varina Garden Club sponsors a tour of area gardens. The 2019 Garden Tour will take place in May.